Queens Park Rangers interim head coach Neil Warnock will miss Friday evening's Championship match at Middlesbrough for personal reasons. The 66-year-old was placed in charge of the west London club after Chris Ramsey was sacked on 4 November. 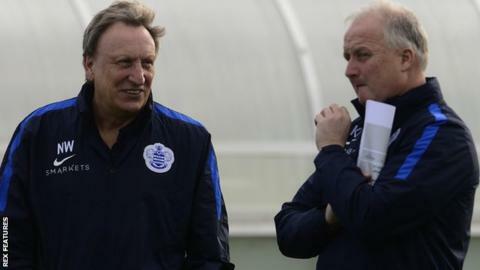 Kevin Blackwell, who joined the coaching staff at Loftus Road last week, will take charge of the side in Warnock's absence. QPR are 13th in the Championship table, eight points off the play-off places. Warnock, who was QPR manager from March 2010 to January 2012, returned in an advisory role to Ramsey in October. The former Sheffield United and Crystal Palace boss said this week that he expected to have just two more matches in charge, anticipating a permanent appointment to be made before their trip to Reading on Thursday, 3 December. "I think the club is moving forward, managerial wise," he told the club website. "I think they will appoint someone in the not-to-distant future, which is good for the club. "I came in to help Chris and with him leaving and someone else coming in, they might not want me around the place. I think it's only fair to let them have a free run." Blackwell, 56, has worked alongside Warnock at five different clubs and has had spells as boss of Leeds, Luton, Sheffield United and Bury.